the applique pictures on them, are from various places. patterns I have purchased in the past for cute applique shapes. I drew the ones I couldn't find, maybe you can draw some too. search the Internet for free patterns too. Then add them to your quilt. Be sure to acknowledge the designer when you do. This is a cupcake that I drew and available HERE. This applique is for the snowball variation block like above. quilt and child your making the quilt for. once I get them back from my dear friend. Next weeks quilt along will be the centre tree. I am looking forward to seeing how your quilt is coming along. Link your blog in a comment so I can visit and see. Delightful post today, as always! I could gaze at your blog header all day...so girly and lovely! Love the cupcake. My daughter is crazy about owls! 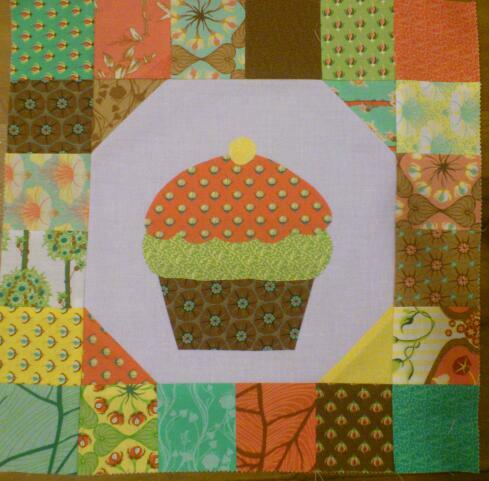 Thanks so much for sharing this quiltalong!